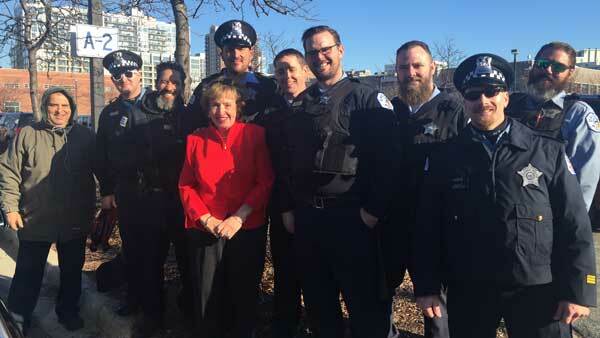 CHICAGO -- A woman praised Chicago police officers who jumped in to help her with a tire blowout. Annie Welsh said she and her mother, who are from Chesterton, Indiana, were heading to an appointment Wednesday when their car hit a pothole and a tire blew out. An Indiana woman praised a group of police officers who stopped to help her after her car hit a pothole in Chicago. Lucky for them, they ended up near the District 1 police station. Eight officers and another Good Samaritan teamed up to replace the bad tire with a spare. "We were so impressed by their instant generosity, humor, friendliness, and efficiency," Welsh said. She plans to bring some holiday treats to the station.